(India/Japan) – Could India Be Japan Inc.’s Next Big Investment Target? (China) – China’s Campaign Against Leftovers; To Beijing, declining marriages is not just a demographic concern -it’s a national crisis. (Philippines) – Who Believes Philippines Are Worth Fighting For? (China) – Microsoft Aspirations in China Meets Perilous Climate prone to protectionism, unpredictable laws and unreliable suppliers. The best performers do orders of magnitude better than the average, but how do you get them to work for your company? (China/Korea/Tech) – Is Huawei Eating Samsung’s Lunch? (China) – Will China ever have its own Harvard? (Australia) – All ovens blazing in Aussie pizza wars; How can small pizzerias capture a slice of the market in the face of the major chains’ $5 pizza deals? Are superstar architects, who often work in cities they know little about, creating buildings that don’t mesh well with the surroundings? Does Your Company Collect Data – Or Hoard It? At what point does a company’s data collection become self-defeating? When Heirs Become Major Shareholders in Asia’s Family Business Groups: Accounting Tunneling or Valuation Takeoff? Our presentation at the Value Unplugged event organized by John and Oliver in Naples and at the Value Investing Summit (VIS) by Ciccio in Trani went well based on the feedback of the participants. We are very honoured to be invited back to speak again at the event, including at a potential new event that is to be held and organized in Denmark by the country’s top value investor. It is really wonderful to be able to meet up with friends from around the world in person and to get to understand one another better. We look forward to sharing more insights with like-minded value investors who appreciate the value of having a knowledge-based process in the marathon of value investing and life. The Value Unplugged presentation material and video “To Catch an Asian Snake: Detecting Accounting Fraud Ahead of the Curve” will be made available for our Moat Report Asia Members. The silent but fierce battle to control one of Asia’s top family business groups with sales of over $80 billion and asset of $86 billion has intensified last week as two sons worked to become the handpicked successor of their patriarch father who turned 92 this October and who had underwent emergency surgery late last year after falling down. Could this be a precursor to the succession and in-fighting risk that will take place in Asia’s family business groups which could override any advantages of the family model? Are there opportunities arising from capitalizing on the uncertainty surrounding the event? The opening quote and investment insight by Merton Miller could ring true for regimes where the dominant corporate form are companies with dispersed, widely-held shareholding structure, but may be less relevant in Asia where entrepreneurial firms are typically tightly-controlled by a family. Many patriarchs in Asia built their fortunes with risky bets in the early post-war years, when Hong Kong was a desolate rock and Singapore was a swamp. They have shifted to become “rent-collectors” from property and related businesses (ports, hotels, retail) or from government concessions (electricity, telco, gas, casino licences). The simplicity of the underlying businesses may account for the ferocity of the family battles since it does not require sacrifice and knowhow for those who take over the business to continue to make money. Asian patriarchs and matriarchs add value in ways that do not appear on balance-sheets through their relationship-based deal-making capabilities. These strengths and tacit knowledge are difficult to bequeath or transfer to one’s children, and these specialized and intangible assets cannot be capitalized easily in the markets. This is why Asian empires systematically struggle to outlive their founders and succession tended to coincide with tremendous destruction of value. Importantly, many of the crown-jewel assets in Asia are either not in the listed vehicles (these are in the private holdings of the tycoons) or that a tycoon has multiple vehicles through complicated shareholding structure for the family to exercise controlling rights with minimal capital. Thus the questions: Why is it that when heirs become major shareholders in Asia, the succession of controlling equity stake to next generation is often associated with tunneling of resources through related-party transactions to firms where the heir holds significant equity stake? What are the accounting properties around the leadership/ownership succession? We will examine these issues, which have important implications for value investors in Asia in the next decade, through the case of Korean and Hong Kong family business groups and two accounting research papers. But first, back to the silent battle. Last week, more than 10 affiliates of Lotte Group exchanged part of their shares with one another to streamline the complex cross-shareholding structure ahead of the implementation of a law banning it. Early this month, the Fair Trade Commission (FTC) had rebuked Lotte Group for having cyclical shareholding structures within the group that form an intricate web for controlling its affiliates. Among the 74 affiliates, Lotte Confectionery (004990 KS, MV $2.8bn), Lotte Shopping (023530 KS, MV $9.4bn) and the unlisted Lotte Hotel, Asia’s third largest hotel chain, are the most important assets in terms of business and the governance structure. 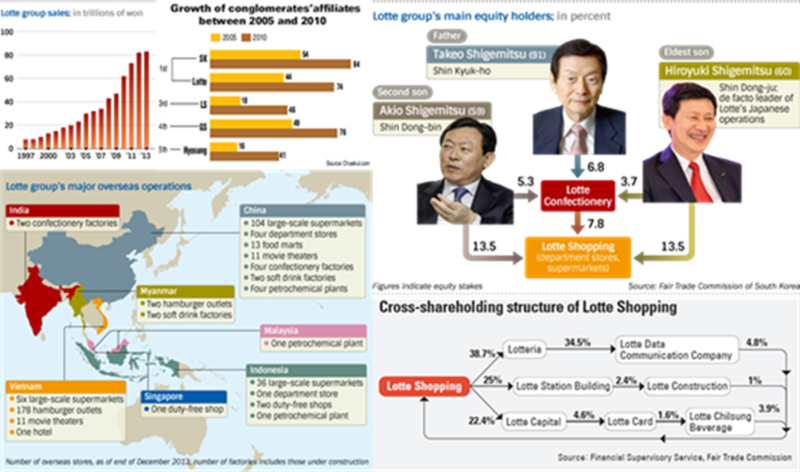 Lotte is one of the top conglomerates in Korea and Asia, thanks to its stable cash flow and unique portfolio composed of cash-rich industries. The two successors to the Lotte empire have been accumulating stakes in the key affiliate Lotte Confectionery since last year. Lotte Confectionery is up 31% this year and still trades at price-to-book of 1x. The power struggle and sibling rivalry was started decades ago when the patriarch Shin Kyuk-ho sent the elder son Shin Dong-ju to Japan and the younger Shin Dong-bin to stay in Korea. But the Korean operations have grown ten times bigger than the Jap ops in the past decades. The cooperative relationship between Japan’s and South Korea’s Lotte groups is cemented only by a marginal capital tie-up, so it could be terminated if the balance of power, underpinned by this capital alliance, tilts too far to one side. Inspired by the German author Goethe’s novel The Sorrow of Young Werther which Napoleon Bonaparte considered as one of the great works of European literature, Shin Kyuk-ho named Lotte Group after the character Charlotte in the book. Founded in 1948 as a chewing gum maker in Tokyo, Shin built Lotte with his marketing flair. Lotte later expanded to Korea with the establishment of Lotte Confectionery in Seoul in 1967, after Korea and Japan re-established diplomatic ties in 1965. Shin had gone to Japan in 1942 during the Japanese occupation period to study. Desperately wanting his career in literature, Shin overcame the disadvantage as ‘a Korean’ through his extraordinary diligence. He obtained investment from a Japanese who witnessed his diligence and built a factory that manufactured cutting oil in 1944. It was his first step as a businessman. However, he had to suffer hardships as his factory was completely destroyed by the bombs in the chaos of World War II. He was able to bounce back from the failure and now, Lotte grew to become Korea’s fifth largest chaebol in businesses ranging from snacks, beverages, department stores, to insurance, construction, amusement parks and hotels. Is there an opportunity for value investors to accumulate Lotte Group’s key affiliates in the governance battle for control in the succession ahead?…… But first, we need to understand the accounting issues, specifically why the succession of controlling equity stake to next generation is often associated with tunneling of resources through related-party transactions to firms where the heir holds significant equity stake. Lotte reminds us of the case of Vitasoy (345 HK, MV $1.3bn), in that most succession events are not smooth and that it takes an idea greater than oneself for different parties to work together harmoniously, especially during crisis periods. Vitasoy was started by Dr. KS Lo with a little bean in 1940 at a factory located at Causeway Bay. KS (Kwee-seong) was the eldest son of Lo Chun-hing, a loyal employee of Eu Tong-sen, patriarch of Singapore’s Eu Yan Sang (SGX: EYSAN SP, MV $290m). In the late 1930s, KS returned to the Chinese mainland and HK to seek out opportunities and was surprised to see severe malnutrition in children caused by diseases in both places. Having got the idea that soybeans could be turned into a milk-like drink with high protein content after attending a talk entitled “Soya Bean: The Cow of China” presented by the American Julean Arnold, KS experimented in 1939 and successfully produced a cheap, nutritious, high-protein soya milk. Both Shin and KS were inspired by the idea larger than oneself: to bring about kindness and betterment to children and people in ruined lands through food technology and quality products and services. This larger idea has galvanized the trust and support among the community of customers, business partners and suppliers throughout the years. Whenever this core value is diluted, without the accompanying culture of trust and decentralization to empower the people in the pursuit of growth, globalization, size and diversification, chinks in the mighty armour start to appear and can deteriorate quickly into major problems that would bring down the organization. As value investors in Asia over the decade plus, we have often observed that the emperor-like and FFF (fight-for-favors) culture in companies is the #1 factor that has resulted in tremendous value destruction around the succession event and why the business does not scale further. There will be doubts about the ability, intention, motivation and fairness in rewards with people not trusting another to act in good faith; there will be envy, anger, and schadenfreude (joy at someone’s misery). How can a system be in place to eliminate doubt, envy, and schadenfreude? Beyond the financial numbers, we like to look for this intangible idea larger than oneself to overcome and transcend beyond the vicious political fight for distributive tangible pools of money and power in Asia’s family business groups. Only then can we be more certain that accounting tunnelling is less likely to occur and valuation takeoff will take place. The Moat Report Asia is a research service focused exclusively on competitively advantaged, attractively priced public companies in Asia.Together with our European partners BeyondProxy and The Manual of Ideas, the idea-oriented acclaimed monthly research publication for institutional and private investors, we scour Asia to produce The Moat Report Asia, a monthly in-depth presentation report highlighting an undervalued wide-moat business in Asia with an innovative and resilient business model to compound value in uncertain times. Our Members from North America, the Nordic, Europe, the Oceania and Asia include professional value investors with over $20 billion in asset under management in equities, secretive global hedge fund giants, and savvy private individual investors who are lifelong learners in the art of value investing. Our latest monthly issue for the month of July investigates an Asian-listed company who’s the global #1 and #2 maker of two types of patient monitoring devices for both clinical- and home-use. Founded in 1981 and listed in 2001, the company’s reliable manufacturing technology platform for over 30 years has enabled it to build a global durable franchise in the niche patient monitoring device market that has stable resilient growth and yet is experiencing potential disruptions led by its new innovation. A secret to its success is its in-house capabilities to combine Swiss design, high-precision electronics and sensors components with clinical healthcare to produce world-class products with cost competitiveness.The firm has competitive technology and patents especially its core competence of having an algorithm to allow fast reading/filtering of signals and outputting the accurate results in a short period of time. The company has the potential to consolidate the market further. The company is also a sticky ODM partner to reputable companies including Wal-Mart, Costco, CVS and it has a diversified customer base with none of the customers accounting for more than 10% of its sales. The company demonstrated that it has bargaining power over its powerful customers with the ability to build its own brand since 1998 (62% of overall sales). 91% of its sales are to developed markets in US and Europe. The company is trading at EV/EBIT 9.7x and EV/EBITDA 8.8x and has an attractive dividend yield at 5.6% and a strong balance sheet with net cash as percentage of market value and book equity at 23% and 47% respectively. The firm has also undertaken the unusual capital management program to reduce 10% of its shares outstanding in Sep 2012 to boost capital efficiency by utilizing the comfortable net cash position. The proactive shareholder-friendly stance backed by its strong net cash position should limit any downside in share price. The company’s terminal value and downside risk will be protected by giants such as J&J, Bayer, Abbott etc who wish to swallow it up to possess its valuable manufacturing technology platform and worldwide patents in algorithm-technology. The company’s worldwide patents in algorithm-technology has been commercialized into an innovative product series that is at the heart of its total solution service business model. This valuable intangible asset is not factored into long-term valuation. The innovative product with the algorithm measurement technology are not merely additional features; it “forces” the clinical community to adopt them as the standard, which in turn helps drive home-use penetration as patients seek a consistent and integrated healthcare experience. It transforms the product into a unique strategy that incorporates software development to create value-added services for health monitoring and collaborating with hospitals and governments on tele-healthcare projects. As a result of its wide-moat, the company has a far superior ROE at 20.9% that is nearly double that of its key giant conglomerate rival. When we compare EV/EBIT relative to ROE and ROA, the company is cheaper by as much as 120-150% when compared to its key giant conglomerate rival. The stock price of the company is down nearly 20% from its recent high in end March 2014 on profit-taking by short-term investors. Share price is back to May 2013 level, representing an attractive opportunity to take position in this long-term durable franchise. The stable long-term shareholdings and patient capital by the founder and the management team who together own around 48% of the equity has enabled the firm to adopt a very long-term approach to building its business and cultivating new growth areas. While he may sometimes be slightly over-optimistic and thinking too far ahead with his long-term opinions, this idealistic engineer-visionary-philosopher has done a fantastic job in continuously defying the odds of many skeptics by growing the company from a small startup into one of the world’s leading patient monitoring equipment company. He is the rare Asian entrepreneur who was persistent in building his own brand despite the threat of offending his ODM customers. He was also early in cultivating and coordinating a global network with high-tech component, R&D and manufacturing in his home country, manufacturing, assembly and packaging in Shenzhen, China and medical R&D and clinical testing center in Europe, including making the difficult decision to establish a direct marketing sales force in Europe and North America given the high cost. Unlike most Asian business owners whose interest and focus in the core business starts to wane due to complacency from growing personal wealth and the inability to scale the core business, the founder is genuinely passionate in the company’s ability to add value to the patients and society. The firm can effectively run without the founder with the long-term corporate culture and management system in place, yet he can inject great value as the steward in new innovations; we believe that this combination is rare for an Asian company and deserves a valuation premium. The world’s #1 ODM (Original Design Manufacturer) and global #5 manufacturer of a consumer healthcare device product that is used frequently, even daily, thus providing the foundation for stable recurring cashflow. This company is also a hidden champion in a niche product segment (50-55% of group’s sales) that has become a high-growth fashion product currently accounting for less than 10% of the overall industry. The company is able to mass-manufacture this niche product, but not the giants, because of its unique process IP in flexible manufacturing system and know-how to handle large-scale complex orders. The manufacture of this product itself is difficult to replicate and requires FDA/CE licenses because of its medical device nature and the entry barrier is not capital but the know-how and R&D expertise. In particular, the manufacturing integrates different fields of science including polymer chemistry, physics, optics, engineering, materials control, process control, microbiology, and, injection molding. The firm has also developed a proprietary system of tracking the manufacturing process of different sets of product so that if a quality issue arose, when and where the problem set of products was being produced could be swiftly identified, thus diminishing the scale and cost of product recall. This system has helped the firm win the long-term trust of its ODM customers to place stable large orders. The Big Four giants do not have such a system and have to incur substantial losses from product recalls. The company also possess its own brand which has many loyal followers and support in its home market where it enjoys a 30% market share and contributes to 25% of group’s sales while sticky ODM customers account for 75% of group’s sales, mainly from the Japan market. As a result of its wide-moat advantages, the firm enjoys a consistently high ROE of 41%, double or triple that of the giants. From FY07 onwards, even during the depths of the Global Financial Crisis in 2007/09, the firm has not raised equity. Since listing in Mar 2004, the company has only done one rights issue in May 2005. Also, it is able to sustain a strong stable cash dividend payout (>70% with 3% yield) with its healthy net-cash balance sheet (net cash $30m; net cash-to-equity ratio 23%) and proven management execution in prudent capex expansion to support sustainable quality earnings growth. M&A deals in the healthcare and medical device sector has been growing due to their strong defensive nature and giants seeking growth to overcome their own patent cliff. The firm will always be an attractive takeover target by giants who wish to swallow it up to possess its valuable flexible manufacturing system and know-how to fill their own missing competency gap and hence will enjoy long-term downside protection in its terminal value. In the battle between “ODM vs Brand”, we find the story of the company to be quite similar to that of TSMC (2330 TT, MV $103bn), now the largest ODM foundry in the world. “Skate to where the puck is going to be, not where it has been,” as hockey legend Wayne Gretzky advised. In our view, the profit and valuation premium in the value chain will start to skate to the “Inno-facturers” who are the hidden ODM innovators (the brand behind brands) consolidating the industry, such as TSMC and this company. While its valuation is not cheap with EV/EBIT (FY13) at 20.6x, when we compare EV/EBIT relative to ROE, the company is relatively cheap, by as much as 130-220% when compared to giants and other comparables. When we compare EV/EBITDA relative to ROE, the valuation gap is 90-160%. This long-term valuation gap implies that the company, with its far superior and sustainable ROE, could potentially double to $2.4bn, as it continues to consolidate its niche product segment and enter into a new product cycle of an innovative product whose patents are expiring in 2014/15 (US/worldwide) to make ASP/margin improvements in sustaining quality profits and cashflow. Its share price has dropped 18% from its recent high and underperformed the index by 26% in the last six months. This will present a buying opportunity for long-term value investors who can penetrate beyond conventional valuation metrics because of a deep understanding of its business model and underlying source of its wide-moat advantages. In Asia, many firms break apart or become value traps due to shareholder conflict, envy and differences in opinion on the business direction of the company. The stable long-term corporate culture infused by the late founder, who established the company in 1986 with the current executive chairman and 2 other key shareholders, to combine the energy and ideas of everyone to work hard to keep the business running forever is underappreciated. The Northeast Asian-listed company who is the world’s largest maker of an essential component with applications in apparel, shoes, diapers, car seats etc. All top 20 global athletic shoe brands, including Nike, Adidas, Reebok, Sketchers, UnderArmor are customers and this Asian innovator with R&D capabilities has forged long-term “spec-in” partnerships with them. Its broad product offering is protected by over 110 patents. By locating its Pan-Asian production plant network in China, Taiwan, Vietnam and Indonesia close to its major clients, including sales/customer service centers and warehouses in US and Europe, the firm is better positioned to understand their requirements, deliver fast and meet their needs. While top 10 athletic shoe brands account 40% of its revenue, the firm has a diversified clientele base of over 10,000 customers, giving it resilience and growth with both the established and emerging brands as clients. The company is trading at PE14e 12x, EV/EBITDA 7.1x and EV/EBIT 10.6x with a dividend yield of 3.9%. Interestingly, its EBITDA margin is double that of Adidas and its 8.7% net margin is higher than Adidas’ 5.4%, though below Nike’s 9.8%. Given the tipping point of its Pan-Asian production network and contributions from its new products and as capex tapers off in the next few years, free cashflow could be around $50-60m and applying a P/FCF of 15x would yield a market value of $750-900m,, representing apotential upside of 100-150%. Thus, the firm offers a similar quality growth trajectory to Nike/Adidas with its unique knowledge-based business model and yet trades at a more attractive valuation and higher dividend yield as downside protection. An emerging Asian Walgreens which is a top 3 community pharmacy operator in its home market. Walgreens is a classic neglected American compounder up over 272-fold to $54 billion from under $200m as it quietly consolidates the market. Over the decade, we observed that it is difficult to scale services-based businesses without an entrepreneurial mindset, committment and execution and thebold and unique management system of the company since 2000 allowed the pharmacists to be part-owner of the business which will lead to increased level of commitment and an owner’s mindset in growing the business for the long-term in the community. The firm has strong cash generation ability due to its negative cash conversion cycle (CCC) in the business model to help the business stay resilient during difficult times and to fund capex needs internally without straining the business model scalability as the network expands. The centralized logistics system provide regular deliveries to all of its community pharmacies enables the outlets to maximize retail space without the need to have space to keep stocks. This also enables the community pharmacies to optimize retail space to carry a wide range of products which is important as consumers increasingly have top-of-mind recall for the company as the destination to go to for their healthcare needs. Like Walgreens, the company believed in the power of embedding technology into the business model to better compete and its financial and warehousing/inventory management systems are integrated with its in-house POS (point-of-sale) system which is linked among all its community pharmacies and head office via virtual private network. The company is founded by fivecollege friends who were somewhat frustrated that their pharmacy degrees were underappreciated and under-rewarded as compared to their medical degree counterparts even though they had studied hard for 4-5 years and had in-depth medical knowledge. They were eager to prove themselves that they are as capable, if not more so. This restless spirit to prove their capabilities resulted in them coming together to be entrepreneurs and they wish to provide the platform for similar restless pharmacists to apply their hard-earned knowledge acquired in the university. We find that this common purpose and camaraderie spirit is rare in Asian companies and makes the company unique to scale up sustainably. The company is currently trading at a EV/EBIT of 13.9x and EB/EBITDA 12.6%. In the next two to three years as the company expands its network of outlets, operating cashflow (CFO) could increase 50-60% and a re-rerating could result in a doubling in market value. An Asian-listed pharmaceutical company which has a dominant franchise in a neglected but growing disease and is a leader with a domestic market share of 49% in this niche segment and is the only fully-integrated player amongst the few pre-qualified WHO firms,giving it >30% EBITDA margin, better pricing power compared to the competition, and significant advantage over other players in ramping up the global business from the current 30% market share in the most-common treatment drug (vs Novartis 50%). Furthermore, the pharma company has the second-highest GP/TA (gross profit/ total asset) ratio in the industry at 56.3% and the most conservative accounting practice in the industry which “depresses” earnings relative to its peers i.e. it is the only domestic firm which expenses, and does not capitalize, all R&D. With the new plant for formulations export to US, the deepening of the niche drug franchise, growing wins in chronic pain and other niche areas and the commercialization of the potential blockbuster product of blood thinner by FY16/17, EBITDA could potentially double to $200m in the next 4-5 years, triggering a valuation re-rating to a market value of $3.4bn, a 130% upside. An Australian-listed company with market value $405m, EV/EBITDA 7.5x, EV/EBIT 10x, div 3%, 70% domestic market share whose management made the controversial bold decision to stop overseas exports in order to focus on cultivating the higher-margin domestic market with innovative marketing strategy and new products and is potentially doubling its supply in the next 3-5 years. It is in its 10thyear of listing after piling the foundation in consolidation, investment, rationalization for its next stage. It has an all-time low debt-equity position 18.6% with healthy balance sheet. “Buffett of Nordic” recently increased position between Apr-Sep this year in the peer comparable of the company and the billionaire investor announced in Nov an acquisition of a rival in a wave of global consolidation andwith the view on a sustained recovery in product prices. My personal motivation in embarking on this lifelong journey has been driven by disappointment from observing up close and personal the hard-earned assets of many investors, including friends and their families, burnt badly by the popular mantra: “Ride the Asian Growth Story!” Iwitnessed firsthand the emotional upheavals that they go through when they invest their hard-earned money – and their family’s – in these “Ride The Asian Growth Story” stocks either by themselves or through money managers, and these stocks turned out to be the subject of some exciting “theme” but which are inherently sick and prey to economic vicissitudes. They may seem to grow faster initially but the sustainable harvest of their returns is far too uncertain to be the focus of a wise program in investment. Worse still, the companies turned out to be involved in accounting frauds. Their financial numbers were “propped up” artificially to lure in funds from investors and the studiously-assessed asset value has already been “tunnelled out” or expropriated. And western-based fraud detection tools and techniques have not been adapted to the Asian context to avoid these traps. 4. Can Reddit Grow Up? Efforts by the freewheeling online community to monetize without driving away its 114 million monthly users will require appealing to advertisers without sacrificing values like personal data privacy. 5. Tencent Holdings Gets Approval For New Private Bank; Did the New York Times Get Alibaba Excluded From China’s Private Bank Pilot? 4. (China/Consumer) – Can Shenzhen handle two luxury good malls? 1. How Krugman Fudged the Truth on U.S. Debt; By mentioning only the baseline projection from the Congressional Budget Office, he downplayed the potentially dangerous growth of U.S. debt as a percentage of GDP. 1. Was America’s revolution driven by political philosophers, or practical men reacting to events?